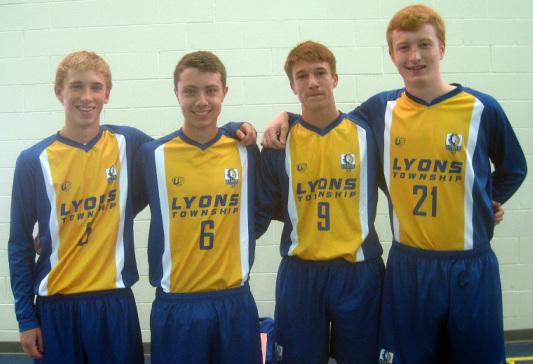 Seniors (from left) Harry Hilling, Cole Gilchrist, Leo Gabrek and Patrick Duncan are returning starters for the Lyons . Defending regional champions St. Charles East, Buffalo Grove and Lyons Township are all hoping a week on the North Shore will produce an early jump toward more big success this season. St. Charles East in particular is starting 2014 on a mission, after their big dreams for last postseason were halted in a 1-0 sectional final loss to Lake Park. The New Trier tournament championship is the first trophy the Saints have their sights on this fall, and Wednesday’s 6 p.m. showdown with Buffalo Grove figures to be the first big test of that quest. St. Charles East (3-0) has outscored its first three opponents 17-2 en route to a 3-0 record, including a 5-1 victory over a solid Neuqua Valley team to open the season. The Saints began New Trier tournament play by defeating Wheeling 6-1. “We want to right the wrong of how last year ended,” St. Charles East coach Paul Jennison said. Buffalo Grove (2-1) raced into the tournament with momentum from two straight wins, but fell 4-2 to the host Trevians on Monday. Carlson knows the challenge his defense will face. The New Trier match represented a step forward for the Buffalo Grove offense. “I was happy we were able to put two in the back of the net in the run of play,” Carlson said. “We could have done a better job of finishing in our first two games, so I hope that represents some improvement moving forward. Wednesday’s Buffalo Grove-St. Charles East match will be played at the Duke Childs Athletic Complex at the main New Trier campus in Winnetka. Most of the tournament is being held at the New Trier Northfield campus. Lyons Township (3-1) is positioned to make its own impact at New Trier, and opened with a 3-0 win over Lake Forest despite a key absence from their lineup. Labbato has seen strong developments all over the field. But progress is being made as the New Trier tournament heats up. “Our first game in the tournament (Lake Forest), we played a very controlled game, holding possession and having creative attacks,” Labbato said. The Lions face Niles West at 4 p.m. Wednesday in round two at New Trier.